Who knew French music could be so fun? Last week I reviewed Gojira's recent album. 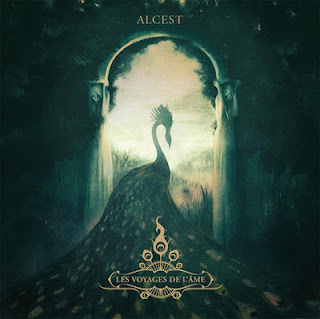 Today I'm looking at the latest album from Alcest. Alcest is one of those bands whose style has evolved and morphed over the years into a style of music that hardly reflects their roots. Some bands pull this off to great effect, while for others, the attempt falls flat on its face. Having begun as an atmospheric black metal band in 2000, the band now plays a thick, reverby shoegazing style where notes stretch as smooly as molen glass and linger in the listener's ear. Vocalist Neige sings almost exclusively in a pensive clean voice as if remembering moments of his childhood. Although some vicious shrieks find their way in to the mix occasionally, these moments are sparse and serve only to alter the mood. These screams never last more than a couple of lines, so they never overpower any of Neige's singing in any one song. While my explanation of the music so far sounds simple (yay for unintentional alliteration), the tunes are anything but. Having thier roots planted firmly in metal, Alcest employ vast, sweeping melodies that are layered and complex, seeming to hinge on emotional memories from times long ago, or looking back on journeys to distant lands. It is a sound that is evocative and at times eerie. You don't have to be a metal afficionado to enjoy Alcest's music. Instead, you must be ready to embark on a journy for which your destination is unknown. Indeed, as the saying goes, it is not the destination, but the journey. Les Voyages de L'ame reflects a 4.4/5 rating. Listen to the opener Autre Temps and the title track below. Thanks for reading and enjoy!